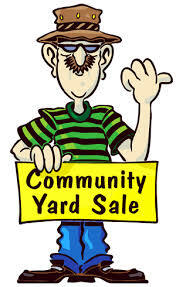 Join us for the annual South Four Corners Community Yard Sale. Please read ALL the information below, as some things have changed. Need help getting organized? Click on Yard Sale Tips for additional information. DATE: Saturday, April 28, 2018 from 8−11 am. LOCATION: We ask that each neighbor set up in their own yard or coordinate with your neighbor and host in their yard. ADVERTISING: The Association will advertise online and in local newspapers. LIST OF PARTICIPANTS: If you would like your address listed on the map, please send it to me NO LATER THAN APRIL 20. We will send out an email with known sale addresses. ITEMS FOR SALE: If you want any specific items listed that you will be selling please include those items in an email when you send me your address. SIGNS: We encourage each street to make sure there is a sign at the end of their block directing traffic to their sale. We will post signs at the entrances to the community and at major intersections throughout the community. VOLUNTEERS FOR SIGNS: Can you make a few signs and hang them a few days ahead of the sale? The community will supply you with poster board and markers. Contact Jenny Cannon (jenny.cannon@gmail.com) if you can help with signs.